Georgia Aquarium hosted an incredibly unique event last week...DeepSea Challenger was on display—presented by National Geographic and sponsored by Rolex—and hosted by scientists and speakers for a mere four hours on Thursday. I happened to be off work on Thursday and learned about this event from a friend's post on Facebook..."Thank you, Social Media and thank you John!" 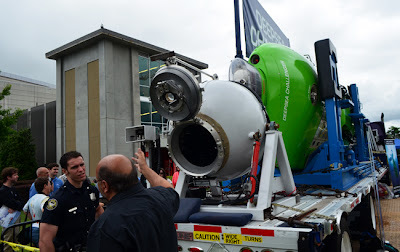 Back in March of last year, James Cameron—well-known as writer and director of The Terminator and Avatar, as well as a film producer, deep-sea explorer, screenwriter, editor, and Academy Award winner—made a record-breaking solo dive to the Earth’s deepest point, nearly seven miles deep in the Mariana Trench, aboard DeepSea Challenger. 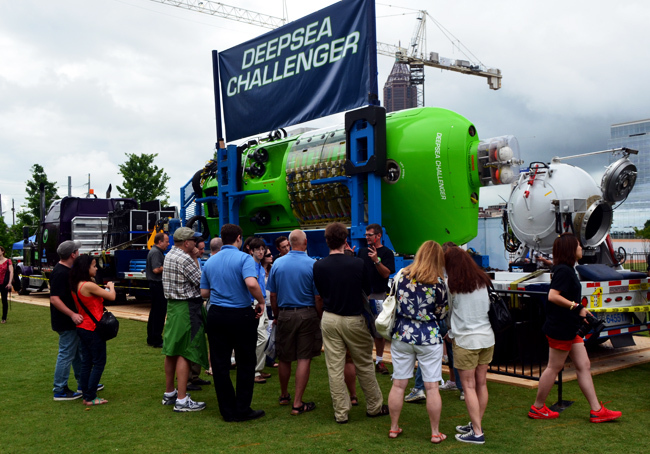 DeepSea Challenger brought out all kinds of visitors...young, old, casual, corporate. I overheard one guy telling another, "I'm supposed to be at the office right now, I can't stay long," which tells me the spectators were true enthusiasts. And who wouldn't be excited to see the vehicle that led to the discovery of new life on our planet at a depth that's deeper than Mt. Everest is tall...that's super cool stuff! 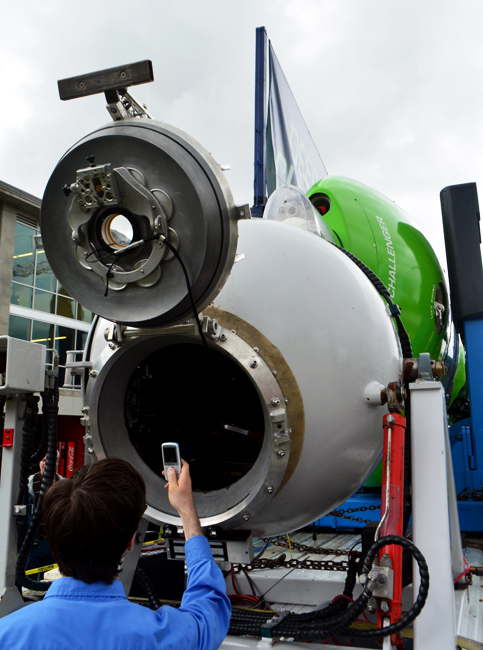 The Pilot Sphere was one of the most fascinating parts of the exhibition. You can see from the photo just how tiny the sphere is. Beyond its outside appearance, its interior is only 43 inches in diameter and contains electronics, life-support equipment, and has to told the pilot, too! Here's the really fascinating part. James Cameron, the pilot, is 6'2"...I'm 6'2" and even though I'm not anywhere approaching claustrophobic—quite the opposite, actually—I still can't imagine being in that sphere for 12 hours at a time! I was told that Cameron did a LOT of meditation studies. 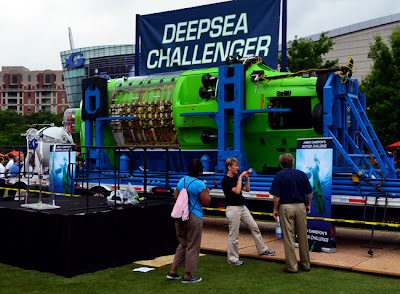 The DeepSea Challenger staff were all enthusiastic in sharing information about the the program and I understand, from their blog, that they got to experience our wonderful Georgia Aquarium. 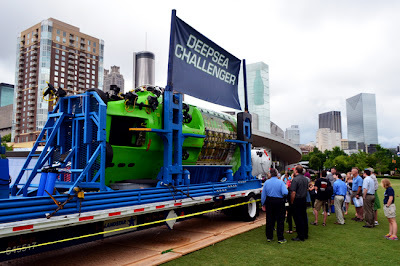 Great news for all my friends in Washington, D.C...the DeepSea Challenger has traveled to the District and is there now. It will be on display on June 11 in front of the National Aquarium. If you get the opportunity...go! All my life I've been a science enthusiast (I'd love to call myself a scientist, but not quite there...maybe one day.). In the meantime, much gratitude to Georgia Aquarium and the DeepSea Challenge team, scientists and otherwise.